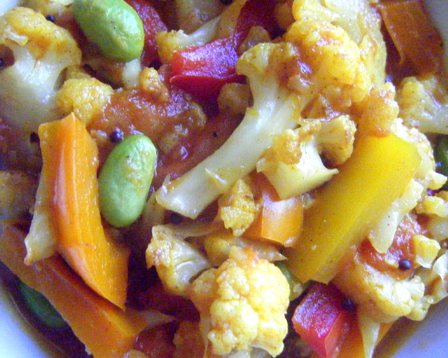 In this recipe, the snowy white cauliflower and the tomatoes and pepper flavors blend well. The cauliflower becomes buttery soft, and the tomatoes are reduced to a glaze. The edamame provides a pretty bright green contrast and provides a mild, delicious protein to the dish. Serve with well cooked brown rice and warm whole wheat bread. Heat ghee in wok, add mustard seeds and when they begin to pop, add hing, and turmeric. Add pepper pieces and stir fry a minute over medium high heat. Add cauliflower and continue stirring (so it doesn’t stick) over medium high heat. Fry the cauliflower until slightly browned. Add the chopped tomatoes and frozen edamame, reduce heat to low and cover, cooking until tomatoes are broken down and cauliflower is soft. If the dish starts to dry out too much as it cooks, add a few tablespoons of water to keep it moist. Salt and pepper to taste.